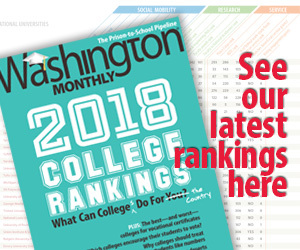 Washington Monthly | Are Income Share Agreements a Good Way to Pay for College? Millions of Americans are struggling to pay for college. Nearly 10 million students and their families took out almost $100 billion in student loans from the federal government in the 2014-15 academic year, pushing outstanding student loan debt to more than $1.2 trillion by the end of 2015. The traditional way to repay student loans is to make the same monthly payment each month for 10-20 years, similar to how mortgages work. But this isn’t always the best setup for students, particularly as college doesn’t always pay off immediately in terms of increased earnings. Newly released government data show that many students are having difficulty repaying their loans after leaving college. About 40 percent of students had not been able to pay any part of the principal within three years of entering repayment. A new idea in paying for college in the United States is Income Share Agreements (ISAs), in which students agree to pay a percentage of their future income to a private company or lender in exchange for additional money to cover college expenses. What is an income share agreement and is it a viable option for students? ISAs function similarly to certain types of federal loans, which allow students to tie their student loan payments to their income. However, the amount that undergraduates can borrow under income-based repayment plans isn’t always enough to pay for college. The typical college student straight out of high school can borrow only $31,000 from the federal government for college with a current interest rate of 4.29 percent. This means many students may need to turn to expensive private loans as an alternative. And here is where an ISA can help. Technically, ISAs are not loans since students don’t have to pay any money back if their earnings are not adequate. This means that if students don’t make money, they could pay back less than what they took out in loans. Instead of interest rates, lenders offer students contracts with the percentage of future earnings paid to the ISA provider and the time period based on a student’s major, year in school and amount borrowed. ISAs have been in use in Latin America for more than a decade with providers such as Lumni financing the college educations of thousands of students. In the United States, there have been a few small efforts to introduce ISAs, but they have largely been unsuccessful. In 2014, Senator Marco Rubio (R-Florida) and Congressman Tom Petri (R-Wisconsin) introduced legislation for an income share repayment option, with a similar bill introduced in 2015 by Representatives Todd Young (R-Indiana) and Jared Polis (D-Colorado). Lawmakers in Oregon too have been pushing a similar program called Pay it Forward. However, none of these attempts worked. More recently, in a first-of-its-kind development, Purdue University launched an Income Share Agreement plan “Back a Boiler” (originally “Bet on a Boiler”) program to help juniors and seniors pay for college. This name plays on Purdue’s mascot of the Boilermaker, a vehicle outfitted to look like the 19th-century steam engines that boilermakers built throughout the country, which fits the STEM-heavy university well. Under the Purdue plan, students would be offered a contract that would specify, based on their major, what percentage of their earnings would be paid and for how many years. Students can receive money to cover any remaining financial need after grants and scholarships, with payment terms based on the total amount of money needed. For example, a student majoring in biological engineering and expecting to graduate in 2018 would pay 3.32 percent of her income to Purdue for 96 months after graduation in exchange for $10,000 today, while an elementary education major would pay 4.97 percent of his income back for 116 months after graduation. Students who make less than $20,000 per year will not need to pay anything back. Their maximum lifetime payment is capped at 2.5 times the initial amount of money provided. Although some students could benefit from ISAs, they certainly aren’t for everyone. So, who should consider income share agreements? In my view, income share agreements make the most sense for three groups of students. First, students in need of additional funds beyond federal loans should consider ISAs as a potential option. Second, since ISAs are technically not loans, they may appeal to students who are particularly averse to taking on debt to pay for college. Loan aversion is particularly common among minority and first-generation students. So a product that doesn’t come with fixed payments might benefit these students. Finally, not all students can access federal loans. About one million students attend community colleges that do not participate in the federal student loan program. Federal loans also aren’t available for educational opportunities such as bar exam prep for law students or “boot camp” courses designed to teach students particular skills outside the traditional college setting. ISAs might be particularly well-suited to these types of programs that are closely tied to employment. Who might not be the right fit? Students who don’t need to borrow beyond the $31,000 in federal loans for a bachelor’s degree are better off with federal loans. This is particularly true for students who plan to work in public service fields and could benefit from the federal government’s Public Service Loan Forgiveness program, that can forgive debt not repaid after 10 years. The terms for ISAs likely aren’t as favorable, as private lenders may offer students contracts of longer than 10 years in order to at least break even. The 40 percent of students unable to pay down the principal on their loans are unlikely to get terms as good as with federal loans. Students who think they’ll make a lot of money after college may not want to consider the ISAs either. ISAs require students to pay a fixed percentage of their income. So, they can be an expensive proposition for students who do really well even if the terms are better than for other majors. These students would be better off taking on federal and private loans and then consider joining the growing number of students who are getting their loans refinanced by a new generation of private lenders, who are willing to give borrowers with successful careers loans on lower interest. In theory, ISAs have a market, but whether students take up this new product will determine its success.